In the aftermath of a backwoods Solstice party in Lamoille County we awoke to a small mountain of dishes and no electricity. The longest night of the year had wrapped us in an icy bear hug. Cold rain followed by dropping temps had frozen everything stiff. Tree trunks, branches, rocks – anything not moving fast enough to dance off the cold crystalline bonds – was treated to an icy exoskeleton. 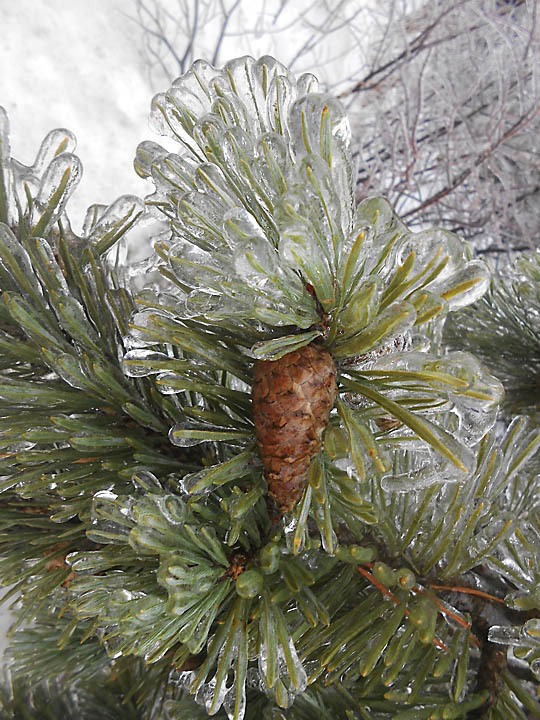 As more precipitation came, the ice coats thickened. The substrate for later drops to adhere to grew as the ice put on layer after layer. Classic positive feedback. Next year’s already-formed buds and catkins, shelf fungi, conifer needles, marcescent oak and beech leaves were all locked inside one-quarter to a full inch of ice. The forest and hill farm landscape performed back-to-back versions of John Cage’s 4’33”. April showers bring more than May flowers, and birds aren’t the only creatures producing fantastic choruses in the springtime. 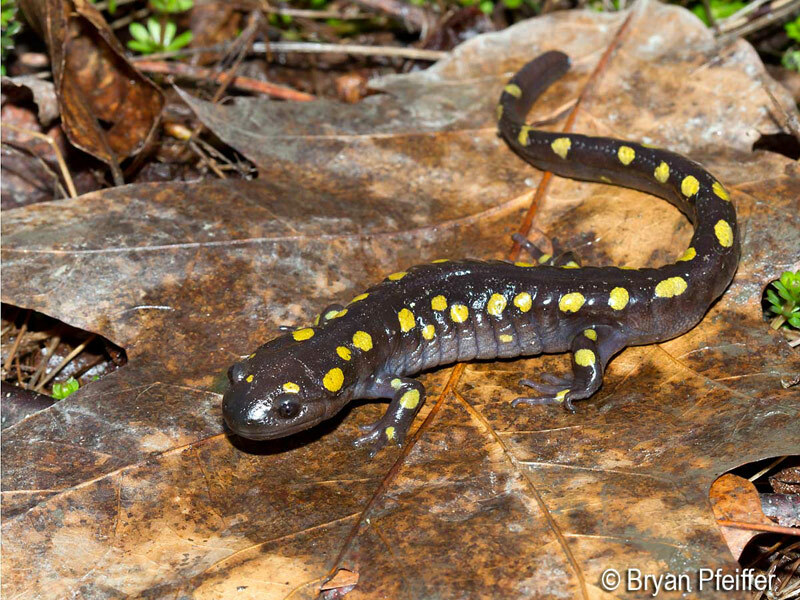 While birders will set their alarms for 5:00am in order to catch the rainbow of spring migrants arriving in Vermont, herpetologists – that is, aficionados of amphibians and reptiles – will spend the wee hours of the night up to their knees in muck and water to glimpse the bizarre courtships of frogs and salamanders. Beating wings fill my view. 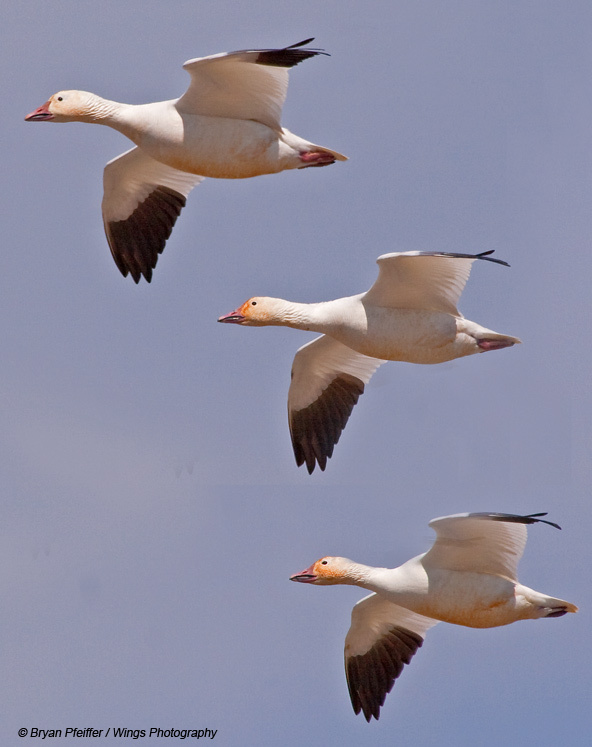 The snow geese are stark white, and the black tips of their wings pulse in contrast with their bodies. Hundreds – no, thousands – of these meaty birds move in unison. They squawk and honk, thousands of calls melting into an urgent and persistent roar. At least that’s what I envisioned. Staying warm in the winter is hard. Chickadees eat constantly in order to survive long, cold winter nights. Squirrels spend precious time and energy creating complex insulated nests. Deer browse on nutrient-poor twigs to get as many calories out of their surroundings as possible. Yet compared to fish and other aquatic organisms, terrestrial wildlife breathe easy – literally. 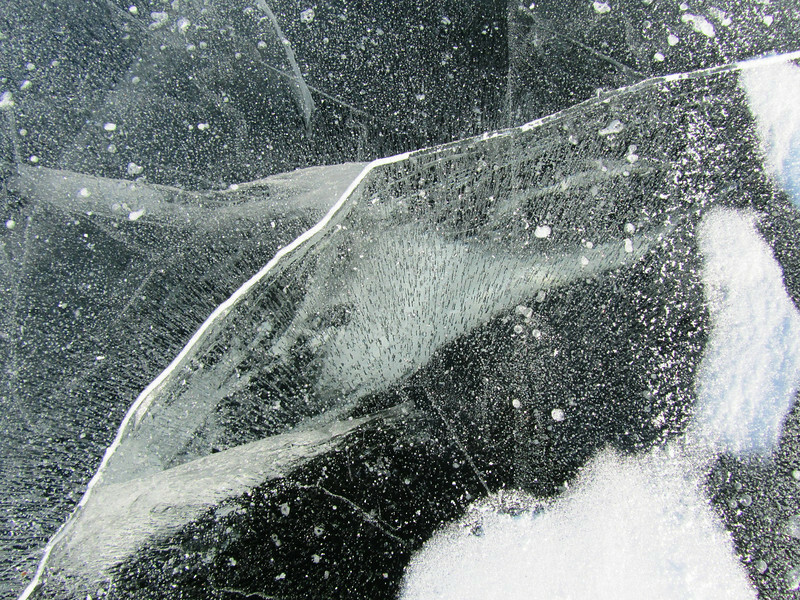 As fish battle the cold through the long winter, they are steadily running out of oxygen. It’s about that time. The leaves hug the forest floor rather than whisper to the wind in the canopy. The nights scatter a frosty pattern across my windows. 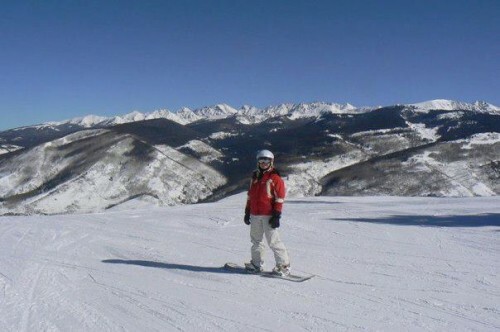 The cool breeze tantalizes my toes with the anticipation of snowflakes and skis. And, it is dark. It is dark as I wait for the bus in the morning and as I make my way home in the evening. The days are getting shorter and the long nights of winter are starting. Many of fall’s keystone changes are set off by the diminishing light. One of these is the changing fur of the snowshoe hare (Lepus americanus). Snowshoe hares look like large rabbits (although they are not all that closely related to the cottontails in our Champlain Valley backyards) with extra-large back feet, which they use to run on top of the snow in the winter and evade their predators. Their range extends from arctic tree-line through the extent of the North American boreal forest down to its southern reaches in the high elevations of Southern Appalachia and the Colorado Rockies. Everywhere you find snowshoe hares, you find snowy white winters. In order to camouflage themselves during the snowiest months, they molt from a dusky brown in the summer to a pure white in the winter. In fall, the shrinking daylight prompts the hares to shed their outer layer of brown fur and regrow a new and more insulative white outer fur. The opposite occurs in the spring. While they are molting they are generally at higher risk for predation since they are both brown and white and can blend into neither snow nor ground. One of the most embarrassing sights you can see as you explore the woods in the fall is a white and brown hare frozen in place wishing and failing to be camouflaged against a backdrop of fallen leaves! 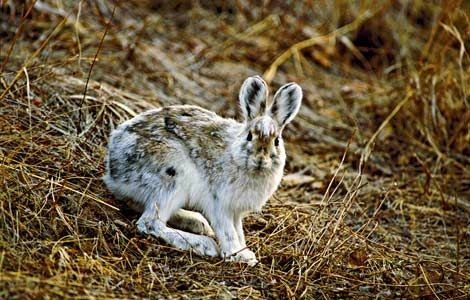 Thus far in the evolution of snowshoe hares, the advantages of camouflage in the winter have outweighed the heightened risk of predation in the spring and fall. Unfortunately for the hares, they evolved in a world where daylight and temperature aligned, at least on average, in a certain way. Since climate change is altering temperatures and precipitation but not day length, this alignment is becoming skewed. In Montana some researchers are finding that the period where the hare’s fur does not match its surroundings is lengthening. This is great for predators for the time being, but if hare populations become too deflated, the boom may become a bust for lynx, bobcat and great-horned owls. Adaptation to changing seasons is necessary for every northern species. As I step out of my house in progressively warmer jackets, I know that the hares up in the mountains are becoming progressively whiter. Soon there will be snow and we will be racing each other across the mountain meadows – if I can find one first! I don’t want to make any controversial statements about whether it is easier to be ma le or female, but it is tempting in this case. When times are good on the forest floor, Jack turns into Jackie and when the going gets rough, Jackie turns back into Jack. We could say that Jackie likes to cruise during the good times, but her reproductive work requires a more nutrient-rich environment. Jack-in-the-pulpit, Arisaema triphyllum, is hermaphroditic and begins adulthood as Jack, its male expression. After maturing past the seedling stage, the plant will produce male flowers on the spadix, the cylindrical reproductive structure commonly referred to as “Jack” and are buried deep inside the pulpit, covered by the hooded spathe. The musty-smelling spadix attracts gnats that enter through an opening in the base of the spathe and move up and down the spadix gathering pollen from the male flowers. 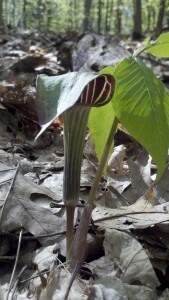 If conditions were ideal the previous year, elsewhere in the forest, another jack-in-the-pulpit stored enough energy to emerge this year as a female, producing female flowers. This growth takes a significant amount of energy and requires optimal conditions of light, nutrient availability and moisture. Thus, Jack will only emerge the next year as Jackie if the conditions are favorable. Jackie comes endowed with two sets of leaves in order to capture more sunlight and produce the energy she needs for reproduction. Male plants in a stressed environment will remain in the male form into the next year. Females under stress will revert to male and conserve energy. Jack-in-the-pulpit is conspicuous in the early fall. The brilliant red fruits draw the eye from the changing canopy foliage in late September to the floor of eastern mixed hardwood forests. The bright red show on an autumn day denotes its success after many potential cycles between its male and female expressions to result in the production of fruits. Perhaps the Jacks boast that they can tough out a nutrient-poor environment and wait out the bad times. Jackie then reminds us how much more energy is needed for her role in reproduction; males have the easy job of producing pollen-bearing flowers. In the end, the strategy of sequential hermaphrodism ensures more successful reproduction. 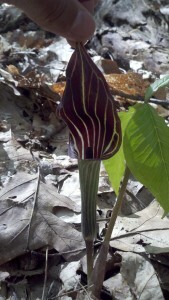 In a stressed environment, the jack-in-the-pulpits in the area simply do not produce seeds. They conserve their resources and produce fewer seeds of a higher quality and viability for germination. When we see the brilliant red among the browning leaves of the fall, the story ends in success of gender synchronicity. 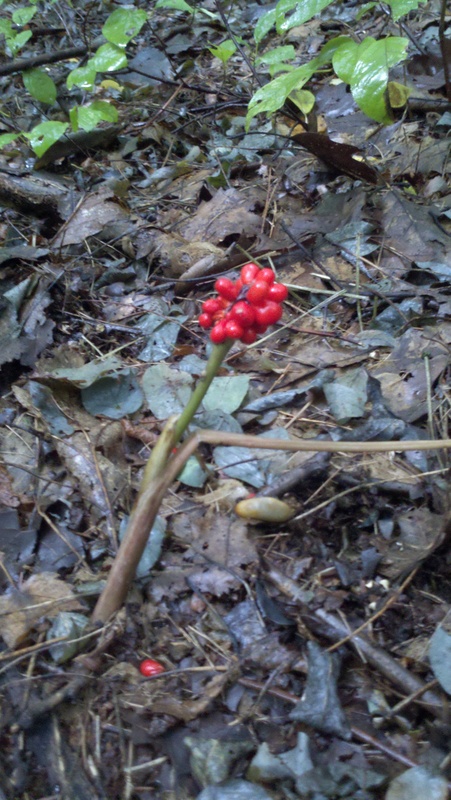 The male plants have browned and wilted along with the other plants of the forest floor while Jackie boasts hermaphroditic success in a show of red to beckon the birds to disperse her seeds. Jackie does steal the show in the end.